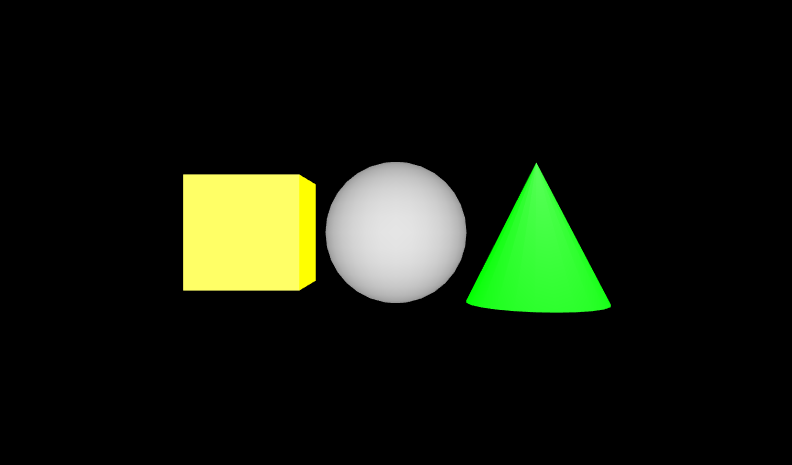 Appearance and Material nodes control a shape's shading color (diffuseColor), glow color (emissiveColor), transparency, shininess, and ambient intensity. Appearance and Material nodes control a shape's shading color (diffuseColor), glow color (emissiveColor), transparency, shininess, and ambient intensity. Colors specify a mixture of red, green, and blue (RGB) light with component values between 0.0 (none) and 1.0 (lots). ColorInterpolator can animate color values, and ScalarInterpolator can animate transparency values. Figure 10 04 Bright Red Sphere Bright red sphere, showing use of Appearance and Material. Figure 10 07 Light Bulb A lightbulb that varies in brightness as the pointing device is held over the socket. Figure 10 08 Blinking Sphere A blinking sphere, controlled using a ColorInterpolator. Figure 10 09 Three Blinking Shapes Three blinking shapes, each controlled using independent ColorInterpolator nodes.